Alan Worrell of SEMA’s Technical Committee says that the SEMA load notice is a safety sign that is intended to allow us to operate our storage equipment safely but can be overlooked. In this blog, he looks at their development over time, their use and limitations; and gives a useful example of how to calculate the correct load for a particular piece of racking. Safety and warning signs are all around us and are part of everyday life. People working in a warehouse are surrounded by goods as part of their working day. It’s very easy to become blasé and lose sight of the fact that storage equipment supports heavy loads. Loaded pallets stored in a warehouse can be up to 1.5 tonne with a typical pallet weighing about one tonne – this is the same as a small car. If a pallet falls from 10 metres, it will take a matter of seconds to hit the floor and by then, will be travelling at around 30mph when it does…..and a pallet is unlikely to incorporate pedestrian-friendly features like crumple zones. Dramatic videos of racking collapse aren’t hard to find on YouTube. Load notices can and do help to prevent them. Recently, the legal onus on end users to, construct, inspect and properly maintain storage systems has grown significantly. April 2015’s revised CDM regulations now regard clients as the head of the procurement chain. In February 2016, new sentencing guidelines were introduced. Businesses and individuals could face much greater fines and more individuals than ever before could face custodial sentences for serious health and safety offences. All suppliers provide some sort of safety, maintenance and usage information. This ranges from a simple list of do’s and don’ts through to an Instruction Manual or Operation & Maintenance manual. Everyone working in a warehouse has to be trained before they are allowed to start work; but reminders about important issues and specific points relevant to a particular installation are always useful. SEMA has always recognized that it is important to provide users of storage equipment with information so that they can use the equipment safely. Guidance is published by individual manufacturers in accordance with the SEMA Code of Practice for the Use of Static Racking. As far back as the 1980’s, this document included recommendations on safety notices. These are the three original types of SEMA warning notices and you will find that some installations still have them displayed. 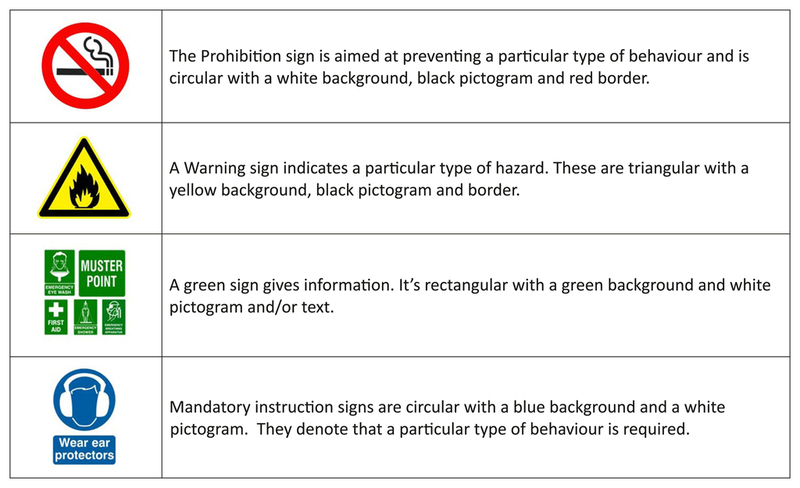 During the 90’s, European harmonisation led to legislation that put safety signage into four categories and standardised the shapes and colours of each type of sign. SEMA’s code was in turn used to develop EN15635: 2008 on Steel Static Storage Systems. With any notice, it is difficult to strike the right balance between the amount of information on the notice and the likelihood of someone reading it. Too little information and some important points can get missed. Too much information and no-one is ever likely to read it – if no-one reads the notice then it may as well not be there. 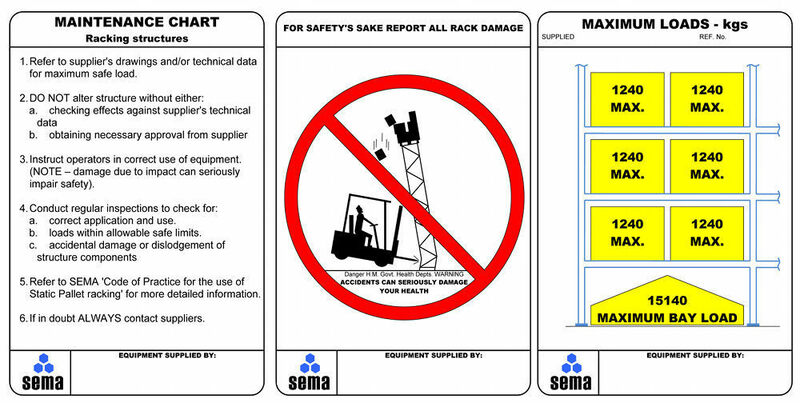 So, the SEMA load notice is intended to strike a balance between giving out too much, and too little and is intended to; give out the main safety messages, deliver key pieces of specific information and be easily read by workers on the shop floor as they carry out their normal duties. This means that the SEMA load notice does not give every last piece of safety information and does not in any way replace formal training. The load notice is an important piece of safety equipment that is sadly often misunderstood and abused. The general information section is applicable to all storage equipment and includes a number of instructions and warnings. This section is a reminder to warehouse users of correct behaviour in this environment. It’s a good idea to understand these as they apply to all types of storage equipment. 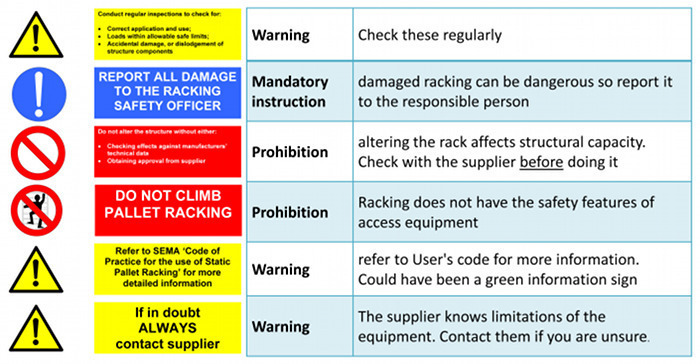 The first is a warning to make sure that regular inspections are carried out, that the rack is being used correctly and that the rack is not damaged. The second is an instruction to report all damage. This means that a damaged rack can be taken out of use if necessary. The third is a prohibition. If you want to alter the rack then check with the supplier BEFORE doing it not afterwards. There’s more on this later. The fourth is a prohibition against climbing the equipment. Racking and shelving is not intended to be climbed and some equipment might topple over if it is climbed. The fifth is a useful information source. The last sign is a warning. The supplier knows the limitations of the equipment. Contact them if you’re unsure. The Specific information part of the load notice gives information that is relevant to the particular installation and is intended to make sure that the equipment is loaded within its limitations. 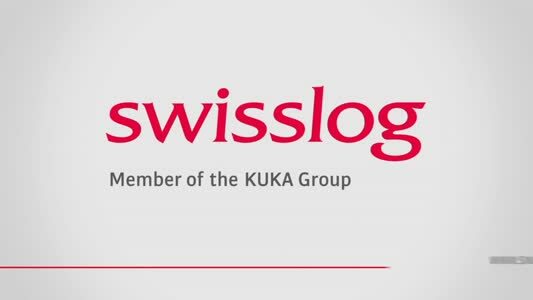 The rectangles show the number and weight of pallets that can be placed on the beams – in this example that are 2 pallets per compartment with a maximum weight of 1000kg each. The position of the beams is critical. In the case of pallet racking and some other types of storage equipment, the height between the beams and the height of the first beam above the floor is crucial to the carrying capacity of the rack. The rack is designed with particular dimensions and, if these dimensions are changed, the effect on carrying capacity can be devastating. For example, if the bottom beam is removed the carrying capacity of the rack can be halved. So, it is important to make sure that these dimensions are as given on the load notice otherwise the rack could easily be unsafe. Loads need to be uniformly distributed. It is normally assumed that the loads are evenly spread out along and between the beams. If this is not true, then the beams could be overloaded. Normal pallets will provide a uniformly distributed load but some other goods such as drums, coils or odd shaped goods might not. "If I have 2 lots of 1000kg pallets per beam level and I have 4 beam levels then is the safe bayload 8000kg?“ The answer is “Not necessarily”. In this example, we show how to interpret the load information. Most pallets here weigh between 500kg and 800kg, but there are also a small number of 1000kg pallets. 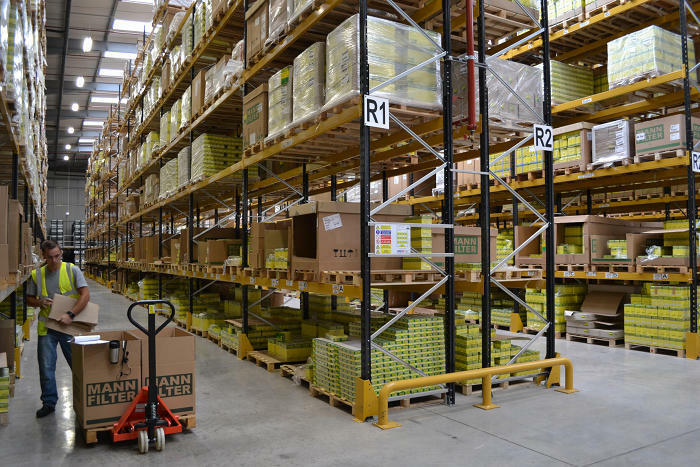 For ease of use, the warehouse operator wants to store the 1000kg anywhere (hence all beams designed for 2×1000kg pallets) but, for an economical rack, not all the 1000kg pallets are put in same place. So, assume that our rack has 4 beam levels. 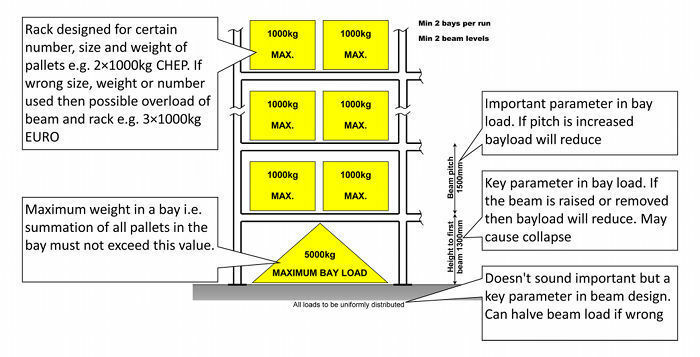 The rack illustration here with 4 beam levels shows a safe bayload totalling 5000kg not 8000kg. Remember that the loads must be less than BOTH the safe beams loads AND the safe bay load! The load notice also includes some administrative information on the supplier of the racking and can help answer queries about the storage equipment. As far as the load notice is concerned there are only two logos that are relevant - the “SEMA Distributor Company” logo and the main SEMA logo. No other logo should ever appear on a SEMA load notice as they have no meaning in this context and do not imply any sort of guarantee. On a Load Notice, the SEMA Distributor Company logo means that the product has been supplied by a member of the SEMA Distributors’ Group and was manufactured by a SEMA manufacturer. The SEMA logo indicates that the product was supplied and manufactured by a SEMA manufacturer. Any other ‘SEMA’ logo on the Load Notice has no meaning in this context. It gives the main points to workers "on the shop-floor" as they carry out their duties. HOWEVER, IT DOES NOT give every last piece of safety information! Learn how major brands and industry experts manage safety in the storage industry at SEMA’s annual safety conference Safety in the Storage Industry: Meeting Customers’ Expectations on Thursday 3rd November at the National Motorcycle Museum. The event starts at 9.30am, includes a buffet lunch and is excellent value for money at £135 + VAT. You can watch our SEMA video on Load Notices at http://bit.ly/SEMALoadNoticesfilm, visit us on line at sema.org.uk or call 0121 601 6359.